The Lakes Entrance part of the shire was reclaimed by Tambo Shire in 1913, leaving Orbost Shire with 9350 sq km. The New South Wales border formed the shire boundary on the east and north, while the western boundary roughly followed the course of the Snowy River. 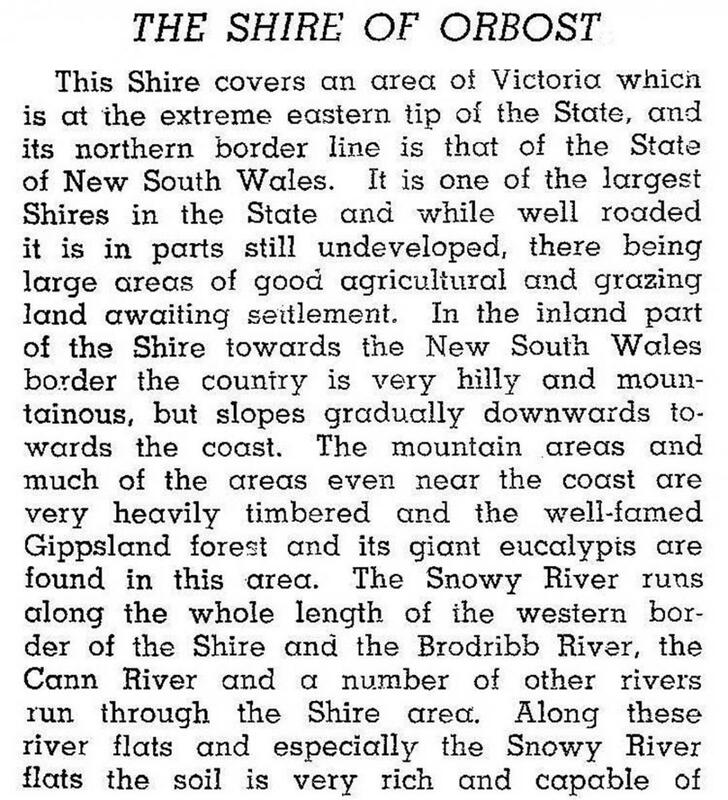 The Princes Highway traversed the former shire from west to east and there was a railway (1916-87). Orbost, 380 km east of Melbourne, was the seat of local government. The shire was large, covering 9347 sq km and much of it mountainous and forested, hence timber getting was a major activity. Settlement was mainly along the lower reaches of the Snowy and Cann Rivers, where dairying, maize and vegetable growing were widespread. Tourism also brought many visitors to the shire. Along the coast, Marlo, Mallacoota and Croajingolong National Park were popular with fishing and boating enthusiasts. Several national parks attracted bushwalkers to the northern part of the shire. 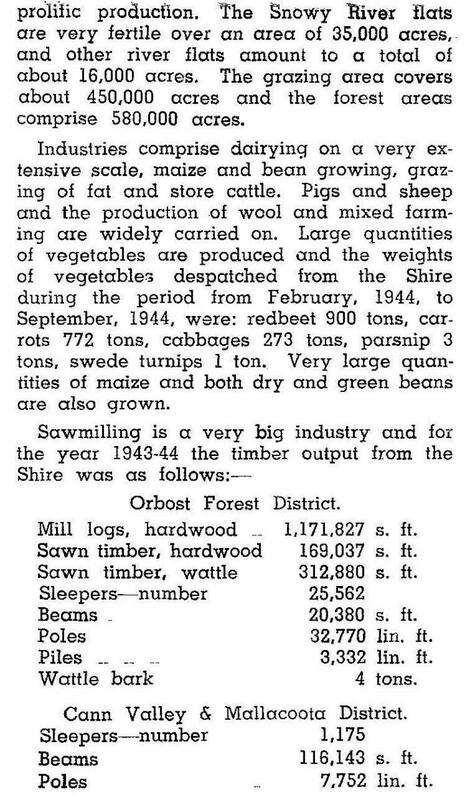 In 1983 the Orbost Chamber of Commerce estimated that 88% of the shire was crown land, most of it forested. It considered that the most viable future industry was timber harvesting and milling. There were 19 sawmills in the shire. The chamber’s vision has been ruled out by controls over logging, and the number of mills declined rapidly. In any event, much of the timber was chipped and exported. Agriculture in 1994 was nearly exclusively grazing: 38,750 meat cattle, 8500 dairy cattle, 39,000 sheep and 12,800 lambs. Bendoc, Cabbage Tree Creek, Cann River, Mallacoota, Marlo, Newmerella and Orbost entries.